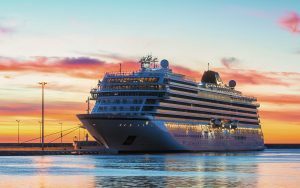 Rocky seas can be a nuisance for cruise ship passengers, but when the weather turns stormy with high seas, that inconvenience can quickly turn into real danger for passengers and crew. That is exactly what happened this week as the cruise ship VIKING SKY experienced extreme weather and complete engine failure, then began drifting towards the shore. The VIKING SKY was carrying 1373 passengers and crew members as it sailed towards Stavanger, Norway. Engines went out in a particularly rough patch of sea, and a mayday call was issued just before the crew managed to drop anchor in Hustadvika Bay. Five helicopters were sent to the scene and began evacuating people, one at a time, as the ship was tossed around by 26-foot seas and 43 mph wind gusts. It was reported that the crew was ready with lifeboats for a complete evacuation, but the heavy seas made lifeboat evacuations impossible.